My eight year old daughter Karina is learning chess and we have gotten into the habit of solving a few mate-in-one puzzles from Laszlo Polgar's book Chess - 5334 Problems, Combinations, and Games every night after homework. 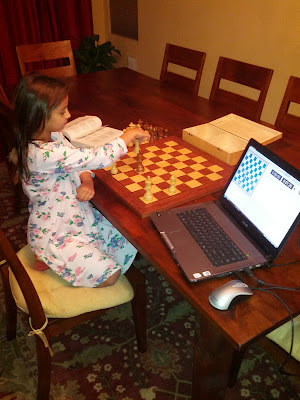 She is really enjoying it, especially when we are using an electronic DGT board coupled to Chessbase Fritz. Each time she solves a puzzle, Fritz rewards her by saying "checkmate" with a German accent.